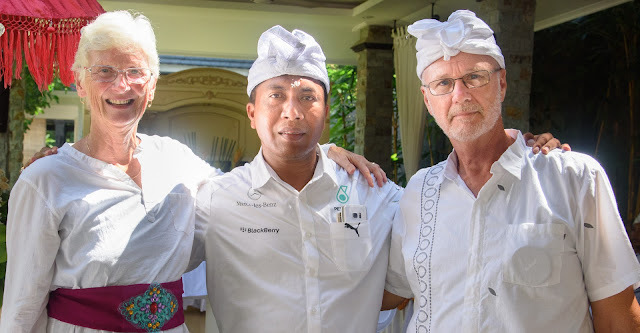 This week we had a special invitation to the home of a Balinese friend who had two things to celebrate. There is also a ceremony to celebrate everything in Bali, but these were special. Firstly, Nyoman had finished construction on a new home and it HAD to be blessed. Secondly, after ten years, Nyoman was being ordained as a top level Hindu priest. The ceremonies lasted over a period of three days, but since he is a true friend, we were specifically invited to a buffer dinner. There was still gamelan music and Balinese singing, but no religious ceremonies. Those had been completed earlier in the day.